Apples of Gold Jewelry has created an original design with this 14K or 18K white gold hand-etched spiral wedding band ring. 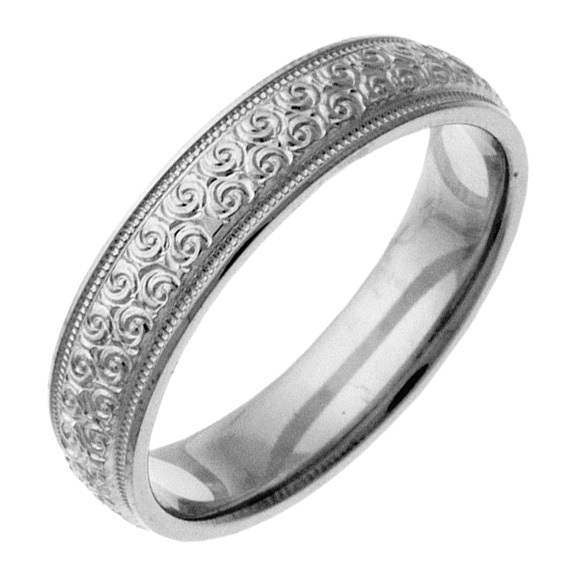 The white gold wedding band is covered with miniature spirals around the entire ring, which are hand-etched into the ring. A small textured band runs along the very top and bottom of the spiral section of the ring, which is available in widths of 5mm through 8mm, and is pictured here in 5mm. This ring is a great choice for both women and men, depending on the ring size required. Featuring a comfort fit interior, this stunning white gold wedding band is a fantastic choice for those looking for something a little more playful. We guarantee our Hand-Etched Spiral Wedding Band Ring to be high quality, authentic jewelry, as described above.